LeCroy Corporation, the worldwide leader in protocol test solutions, has upgraded their DDR3 protocol analyzer software with new debug features that improve the system’s ability to find and resolve memory integration issues. LeCroy’s Kibra™ 380 is the industry’s first true, standalone protocol analyzer for DDR3. Designed to provide comprehensive DDR3 bus and JEDEC timing analysis, the system now supports testing LR-DIMM and includes productivity features like overlay mode, snap-to-edge, and CrossSync™ synchronization. The Kibra 380 DDR3 analyzer introduced earlier this year represents a new approach to testing DDR3 memory at the system level. Fully standalone, this low-cost analyzer uses dedicated triggering logic to identify over 65 unique JEDEC command and timing violations in real-time. A software-based state listing and waveform viewer allows precise timing measurements between command, address, and control signals. Detailed event statistics are reported by bank and rank to provide insights into overall memory utilization. With this latest software release, the Kibra 380 provides enhancements designed to accelerate navigation, timing measurements, and waveform analysis. In overlay mode, all signal lines can be floated for easy visual comparison. With LR-DIMM (Load-Reduce DIMM) support, the system can be used to test higher density memory systems. 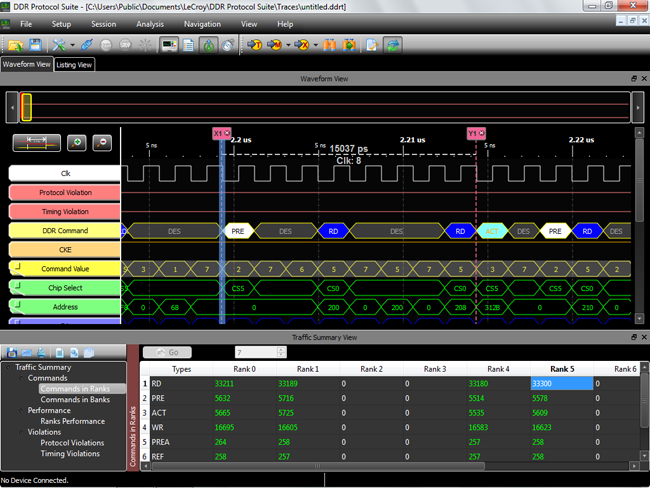 Adding the CrossSync framework to the DDR3 analyzer allows LeCroy’s other analyzer platforms to be synchronized to provide time-aligned display of protocol traffic across different busses. Small and portable, the Kibra 380 is controlled using any Windows-based PC and includes the necessary interposer probes capable of monitoring two slots of quad rank DDR3 DIMMs operating to 1600 MT/s. Along with built-in CrossSync ports for performing multi-protocol analysis, the Kibra 380 also features unique, real-time trigger-out for Read / Write operations (WE). Using this dedicated, low latency SMA trigger out signal, the scope can perform signal integrity testing using the DQ/DQS relationships to distinguish between Read / Write operations on the bus. LeCroy Corporation is a worldwide leader in serial data test solutions, creating advanced instruments that drive product innovation by quickly measuring, analyzing, and verifying complex electronic signals. The Company offers high-performance oscilloscopes, serial data analyzers, and global communications protocol test solutions used by design engineers in the computer and semiconductor, data storage device, automotive and industrial, and military and aerospace markets. LeCroy's 45-year heritage of technical innovation is the foundation for its recognized leadership in ”WaveShape Analysis”- capturing, viewing, and measuring the high-speed signals that drive today’s information and communications technologies. LeCroy is headquartered in Chestnut Ridge, New York. Company information is available at http://www.lecroy.com.